-Brandon Adams beats Shane Mosley Jr to win the latest The Contender series. Prato, Italy: Super Middle: Dragan Lepei (16-1-2) W TKO 2 Alex Marongiu (7-11-1). Lepei wins the Italian title with stoppage of Marongiu. “Fury” Lepei was pressing hard and throwing bombs in the first but “Speed” Marongiu showed some neat defence moves to stay out of trouble. The second round was following the same pattern until a right hook sent Marongiu down heavily. 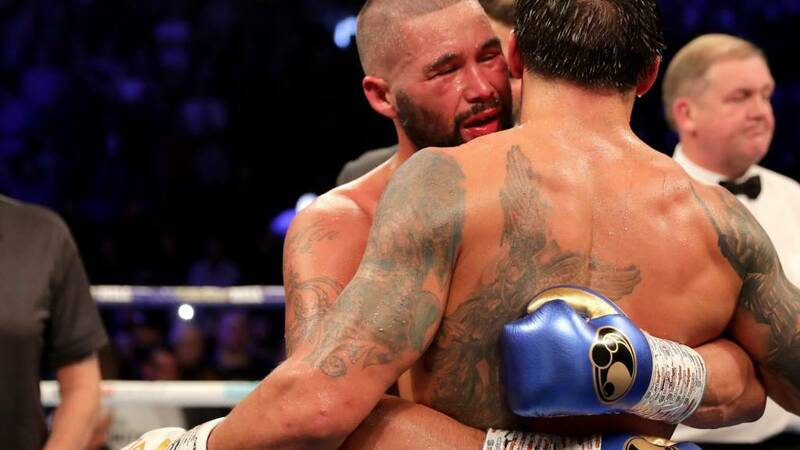 He struggled to his feet but the referee decided he was in no condition to continue and waived the fight over. Ninth win by KO/TKO for Lepei who extends his unbeaten run to eight bouts. Marongiu falls to 1-4-1 in his last 6. Guaynabo, Puerto Rico; Light: Felix Verdejo (24-1) W KO 2 Yardley Armenta (24-12,1ND). Verdejo signals his return as he obliterates Mexican Armenta inside two rounds. Verdejo was hunting Armenta down in the first with Armenta under a constant barrage and rarely getting off the ropes. Early in the second a left hook to the chin dumped Armenta on the canvas and the fight was over. The 25-year-old Puerto Rican was tipped as a future world champion as he rattled off 23 straight wins. He was rated No 1 by the WBO so the mandatory challenger to Terry Flanagan. The fight was all set for 16 September last year but had to be postponed due to an injury suffered by Flanagan. Verdejo was then injured and when he recovered he was put in a keep busy fight against Mexican Antonio Lozada in March this year only for Lozada to do the unthinkable and stop Verdejo in the last round. After a couple more fight it is expected that Verdejo will finally get a title shot. Ninth loss by KO/TKO for Armenta who was halted in two rounds by Richard Commey in August. Marcos Paz, Argentina: Super Welter: Rodrigo Maizares (7-3) W PTS 10 Henrri Polanco (13-4-1). Minor upset as Maizares easily outscores Polanco to win the vacant WBC Latino title. Southpaw Maizares led from the start finding the target throughout the fight with his jab and following lefts. Polanco just never got into the fight and in his frustration landed a very low punch in the fifth and was deducted a point. A static Polanco never posed a threat as Maizares closed the fight strongly for an emphatic victory. Scores 97-92 twice and 100-89 for Maizares on the three cards. Maizares is building a small run as this was the fourth win in a row. Argentinian-based Dominican Polanco was 3-0-1 in his last four fights. Rio Cuarto, Argentina: Light: Javier Clavero (25-4) W PTS12 Carlos Cordoba (10-4,1ND) Argentinian champion Clavero adds the South American title to his collection with victory over Cordoba. Clavero won this one on the back of a knockdown and a standing count in what was mostly a close fight. Cordoba used some skilled work to build a slight lead but in the sixth he was put down by a body punch. In the seventh Clavero had Cordoba in serious trouble and a stoppage looked likely but the referee gave Cordoba a chance to regroup by applying a standing count. The remaining rounds were close but both fighters dropped a point in the last Clavero for a low punch and Cordoba for spitting out his mouthguard. Scores 113-111 ½ twice and 114-110 for Clavero. The new champion is 3-1 in fights this year. Cordoba was on a good run being 7-0,1ND in his last eight fights. Sydney, Australia: Light Heavy: Reagan Dessaix (16-1) W TKO 2 Steve Lovett (17-3,1ND). Important domestic victory for Dessaix as he halts Lovett in two rounds. The tall 22-year-old “President” Dessaix moves to eleven wins by KO/TKO and this is tenth win in a row as he retains the WBA Oceania title. He is No 15 with the WBA. Dessaix was a good level amateur winning six Queensland State titles, two Australian Youth titles and competed at the World Youth Championships. Lovett tried his luck in the USA but after back-to-back losses to Craig Baker and Lionell Thompson returned home and had won his last two fights. Sydney, Australia: Super Feather: Joel Brunker 34-3) W TKO 3 Rivo Rengkung (37-28-6). Brunker starts his rebuilding with stoppage of experienced Indonesian loser Rengkung. Two of Brunker’s losses have been against world class opposition in Lee Selby and Josh Warrington but a defeat in July to New Zealander Nort Beauchamp was a surprise. Twelfth loss by KO/TKO for Rengkung. Nuremberg, Germany: Middle: Wanik Awdijan (24-1) W PTS 10 Maono Ally (8-3-1). Awdijan wins the vacant IBF Youth title with decision over Tanzanian Ally. Awdijan used a sharp jab to keep the aggressive Ally out over the early rounds. It was the fourth before Ally really made any impression and he was wild with his punches. Awdijan stuck mainly to the jab as his right hand had been in plaster until a few weeks before the show so he used it sparingly. He was a comfortable winner on scores of 97-93 twice and 99-91. The Armenian-born Awdijan had also suffered a shoulder injury earlier in the year so is now hoping to be injury free and more active. Ally had won 5 of his last 6 fights and did his job here of giving Awdijan ten rounds of work. Cave, Italy: Super Feather: Michael Magnesi (13-0) W PTS 10 Giuseppe Carafa (10-3-1). Fighting in his home neighbourhood Magnesi retains the Italian title as and outpoints Carafa. The aggressive start from Magnesi almost overwhelmed Carafa. In the first round he made Carafa stumble with a right hook and then floored him late in the round with another right. Carafa made it to the bell and used some good skills to stay in the fight. Magnesi continued his storming tactics and Carafa was warned in the sixth for holding and rocked late in the seventh by a combination. Carafa was being forced to stand and trade punches and the eighth and ninth were filled with torrid exchanges but Magnesi’s harder punch saw him on top to the bell. Scores 99-90, 99-91 and 98-91 for Magnesi. The 23-year-old local was making the first defence of the national title and will now look for an opportunity to fight for the EU title. Carafa falls to 1-3 in his last 4 fights.